The Vectrex is everybody’s favourite vector-based console from the early 1980s. Vector graphics really didn’t catch on in the videogame market, but the Vectrex has, nonetheless held on to a diehard contingent of fans that continue to tinker with the platform to this day. [Arcade Jason] just so happens to be leading the pack right now. The Vectrex has always been a monochrome machine, capable of only displaying white lines on its vector monitor. Color was provided by plastic overlays that were stuck to the screen, however this was never considered a particularly mindblowing addition to the console. [Jason] decided he could do better, and dug deep into his collection of vector monitors. With a 36″ color vector monitor to hand, the Vectrex was laid out on the bench, ready for hacking. The bus heading to one of the DACs was hijacked, and fed through a series of OR and AND logic to generate color signals, since the original Vectrex hardware had no way of doing so. This is then fed to the color monitor, with amazing results. [Jason]’s setup is capable of generating 8 colors on the screen, and it’s almost by some weird coincidence that this really does make the classic Vectrex games pop in a way they never have before. It’s also a testament to a simpler time that it’s possible to hack this console’s video signals on a breadboard; modern hardware runs much too fast to get away with such hijinx. It’s an epic hack that through experimentation and some serendipity, has turned out some exciting results. [Jason] is now in the process of taking this to the next level, experimenting with adding color intensity control and other features to the mix. It’s not [Jason]’s first time around these parts, either – we saw his big-screen Vectrex just a month ago! Color palettes are key to any sort of visual or graphic design. A designer has to identify a handful of key colours to make a design work, making calls on what’s eye catching or what sets the mood appropriately. One of the problems is that it relies heavily on subjective judgement, rather than any known mathematical formula. There are rules one can apply, but rules can also be artistically broken, so it’s never a simple task. To this end, [Jack Qiao] created colormind.io, a tool that uses neural nets to generate color palettes. It’s a fun tool – there’s a selection of palettes generated from popular media and sunset photos, as well as the option to generate custom palettes yourself. Colours can be locked so you can iterate around those you like, finding others that match well. The results are impressive – the tool is able to generate palettes that seem to blend rather well. We were unable to force it to generate anything truly garish despite a few attempts! The blog explains the software behind the curtain. After first experimenting with a type of neural net known as an LSTM, [Jack] found the results too bland. The network was afraid to be wrong, so would choose values very much “in the middle”, leading to muted palettes of browns and greys. After switching to a less accuracy-focused network known as a GAN, the results were better – [Jack] says the network now generates what it believes to be “plausible” palettes. The code has been uploaded to GitHub if you’d like to play around with it yourself. Check out this primer on neural nets if you’d like to learn more. We’d like to know – how do you pick a palette when starting a project? Let us know in the comments. 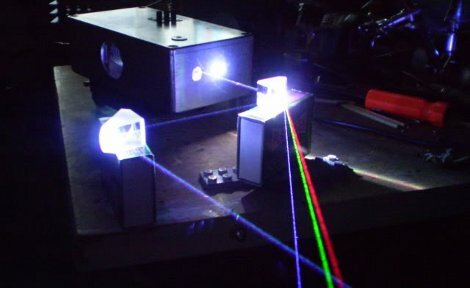 [Carl] sure has come a long way with laser modifications, now introducing his portable RGV Full Colour Laser. Although it feels just like yesterday when he showed us his green spiro and his Lego diffraction grating projector. But enough of the past, the RGV laser is built using a White Fusion Mixing Kit and his own Full Colour Driver Extension. We couldn’t find any circuit diagrams or code to build your own at the moment, but it appears fairly straight forward and you can always take a look at [c4r0’s] Colour Laser.